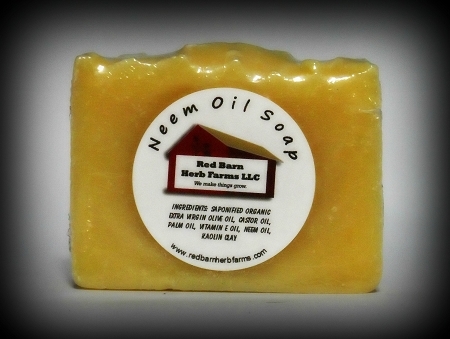 Handcrafted Neem Oil soap, naturally antibacterial, antifungal and an excellent natural insect repellent. Nutty scent. Neem is also known to help soothe itchy, red, inflamed, irritated skin (think eczema, psoriasis) and combats bacterial and fungal infections, as in acne, boils and ulcers. Neem is also used to lighten scars and even skin tone and pigmentation. Ingredients: Saponified Organic Olive, Palm Kernel and Castor Oils, Neem Oil, Kaolin Clay, Vitamin E Oil. *Actual soap appearance will vary somewhat.